With disposable electronic cigarettes finding their way into local grocery stores and pharmacies, the average consumer is seeing more and more e cigs everywhere. In most places, the disposable e cigs have already secured a place behind the register, like at Walgreens and CVS drug stores. I am not saying there is a great variety, but most likely you will see one or two different types of disposables if you look to the sides of the main tobacco display. It is nice to have the option to grab a quick disposable e cig nearby, and with most online shippers, you can get them in a day or two now. For folks that are considering making the switch from real tobacco cigarettes to electronic cigarettes, disposables are often the initial step to try them out and get your feet wet. Most of the time, making the switch involves some sort of time period to adapt to the change from smoking to vaping. Since many of the new disposables produce a rich and thick vapour, they are often one of the best e cigs to use when making a change, and will provide a high quality vaping experience. Disposable e cigarettes have become a whole lot more affordable over the past year and a half, and even a lot of ex-heavy smokers wind up using disposables because of their fantastic performance. Perhaps, the biggest reason for trying a disposable e cig is their convenience, and you won’t have to drop a wad of cash just to try a couple of different brands out. Puffing on e cigs will typically save an average smoker at least $500 annually, and heavy smokers usually see savings of about $1000 – not to mention lowering the risk of cancer. There are a lot of new players entering the electronic cigarette market each month, and the biggest tobacco companies are taking notice. Not only do e cigarettes represent a more profitable product for these companies, but with the larger players developing their own disposable e cigarettes now, the advertising overall is educating people like never before. Many tobacco industry experts are saying that e cigarette sales may eclipse tobacco cig sales over the next decade or two, so you can expect to see many more options and brands in the near future. Disposable electronic cigarettes are currently in an “unregulated” market, which really means that the government does not watch and tax the companies yet. The e Liquid which contains the nicotine solution for e cigarettes is made up of ingredients that are labelled generally safe for consumption by the Food and Drug Administration, and they are really a doorway for more and more people to try them out and see if vaping will curb their nicotine cravings. Disposables e cigarettes are made with a lot of quality, and do not have the risks of short circuiting the battery like e cigarette starter kits and refillables do. This is because they are just one unit, and cannot be taken apart. This means that the risk of getting e liquid on the battery or circuitry inside is almost impossible, and most people just throw them away after they get good 300-500 puffs out of them. The only real negative with disposable e cigs right now is that you just don’t know how much battery or e liquid is left, and that is why the new Logic disposable e cigarette has a “vape counter” – which is sure to be a big hit in the near future. This vape counter tells you how many puffs are left, that way you won’t feel like you are stranded on a dirt road with an empty gas tank. A lot of people are suggesting that it will quickly become the best disposable e cigarette when it debuts. Heavy users seem to really like the thick vapour plumes that the disposable e cigs emit. The cost of disposables has come down to just a fraction of what they were a couple years ago, and some vapers even use them exclusively because they work so great. Since e cigarettes are getting so much press lately, including celebrities using e cigarettes, it seems like the naysayers and flat out liars have come out of the woodwork too. A lot of people are saying that disposable e cigs aren’t made as well as regular e cigarettes or that they don’t deliver the performance – but it just isn’t the truth. As we discussed above, they don’t come apart into 2 or 3 parts, so it is rare to hear of one that just stops working because it wasn’t made well. A potential negative of disposables, not really a misconception, is that you can’t decide how much flavour or nicotine you want in each drag. This is why regular e cigarettes are great when you find a disposable that you like, but you want to really customize your experience for your tastes and nicotine needs. Once you get the hang of mixing or tweaking your own e juice, you will find out what most electronic cigarette users claim – that it is the best nicotine delivery system that they have ever used. 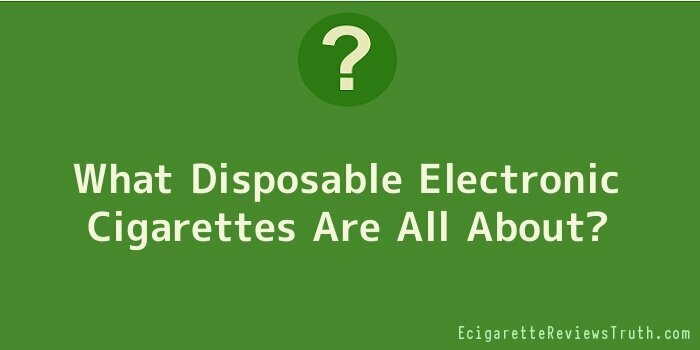 What is the best electronic cigarette disposable for you? It depends on your taste and style. You will have to try a few brands to see which one fits your personal preferences, and if it is close to your liking, maybe that is the brand to get a starter kit with.